A pair of stereo headphones might seem like a pretty simple thing. You plug them in to a computer or iPod and you listen to music: what else is there to know? The truth is that there’s a lot more to headphones than you might think. At a broad level there are earbuds, on-ear headphones, and over-ear headphones. Within each of these types, there are different quality levels and price points designed for different types of listening. A pair of headphones that a DJ or musician uses might be very different from the kind a recording engineer uses or a commuter uses while riding public transit to work. Today I want to talk about over-ear headphones such as Beats by Dre, Skullcandy Hesh, and the AudioSpice Force headphones by US Digital Media. 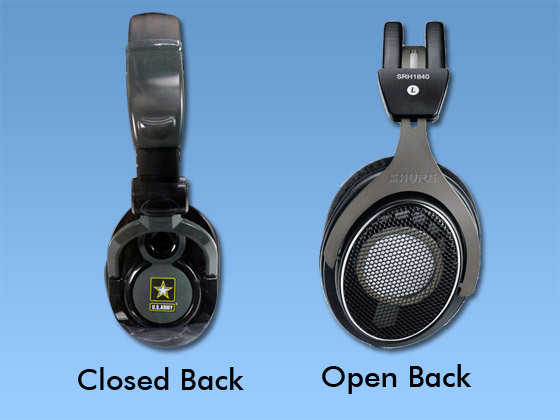 These type of headphones fall into two categories: open back and closed back. What is the difference between the two and why should you care? Read on to find out.